Hello LDV readers! It's Paula and Rebecca from Sea Island Drive. We're back with another Two Styles, One Room post. Today we're featuring a kitchen that we're sure you'll all want for your own (we certainly do)! We all want our homes to have a certain level of elegance, right? A place we're proud to come home to and want to entertain in. But sometimes practicality and durability override that elegance, especially in the rooms that we really live in...like our kitchens. This kitchen combines elegant, sophisticated finishes and fixtures with casual, approachable styling and details. The result is a truly beautiful space that is also welcoming and comfortable. Casual and elegant, don't you think? Cararra marble countertops, polished nickel faucets (at two sinks! ), clean white glass-front cabinets, and a polished white tile backsplash create a clean, upscale foundation that is undoubtedly elegant. By adding an industrial light fixture, woven roman shades, a more modern stainless steel hood, and a cozy banquette in the corner, the space becomes family-friendly and ready to entertain in. This is one of our favorite combinations. We both believe that your home should be beautiful, elegant, and a place you are proud of, but it is equally as important that it be comfortable and practical. It's important that your house feel like a home where you can kick your feet up! 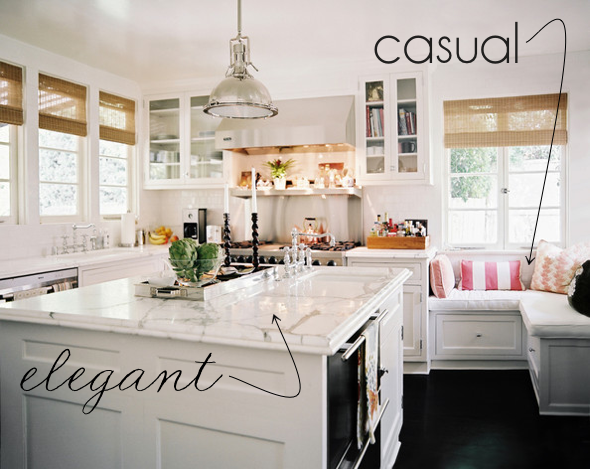 Is there a space in your home that you feel perfectly combines casual and elegant? Or maybe one that you're wanting to make a bit more elegant? I totally adore the mix here -- something I strive for in my own home! to make it feel chic without being uncomfortable. This achieves! I adore this kitchen, it is very much my style! Great elements! Love the window seat... it would be so great to curl up there with a book right now... but that island is soo beautiful too! One of my favourite kitchen images!